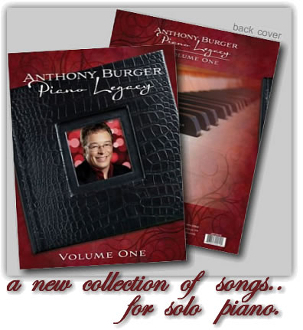 Anthony Burger Productions is thrilled to offer you this brand new collection of sixteen songs, arranged for solo piano as only Anthony could envision. The book includes traditional southern gospel, hymnal classics, popular secular favorites, and several Christmas arrangements as well. Songs from the recently released projects, God's Country and Christmas With You along with many others never offered in print before are also among the titles in this book. Anthony Burger's Piano Legacy includes one of the most popular Christmas songs of all time, White Christmas. This is a rare and special honor granted by the Estate of Irving Berlin to Anthony Burger Productions.